After trying out our snowshoes we were very tempted to stay up in Arinsal and spend the evening admiring the views, but a quick check of the overnight temperature and we swiftly abandoned that idea. Minus 7 was too cold even for us fairly hardy souls. Instead we backtracked down the valley to a parking area we had seen earlier next to the side of the road. Parking Borda de Torres is on the outskirts of the small but lively town of La Massana and offers services and 16A electricity for 12 euros per 24 hours (you can use the services by paying for one hour’s parking which I think was 3 euros but I didn’t make a note), we thought it was worth a try. The parking spaces were close to the road and slightly sloping, but we didn’t have much overnight traffic noise, certainly not enough to wake us up and with our heating on we were so warm and toasty we didn’t feel like getting up in the morning. When we finally dragged ourselves from our slightly stuffy bedroom we had a look at walks available in the area. 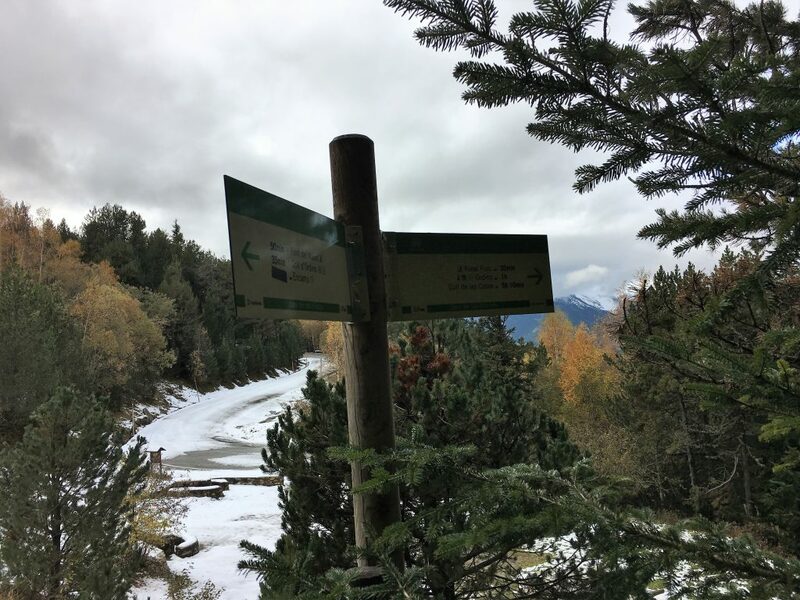 We decided to do a circular walk that would head up on the Cami de Sola and head back on the Cami dell col d’Ordino. 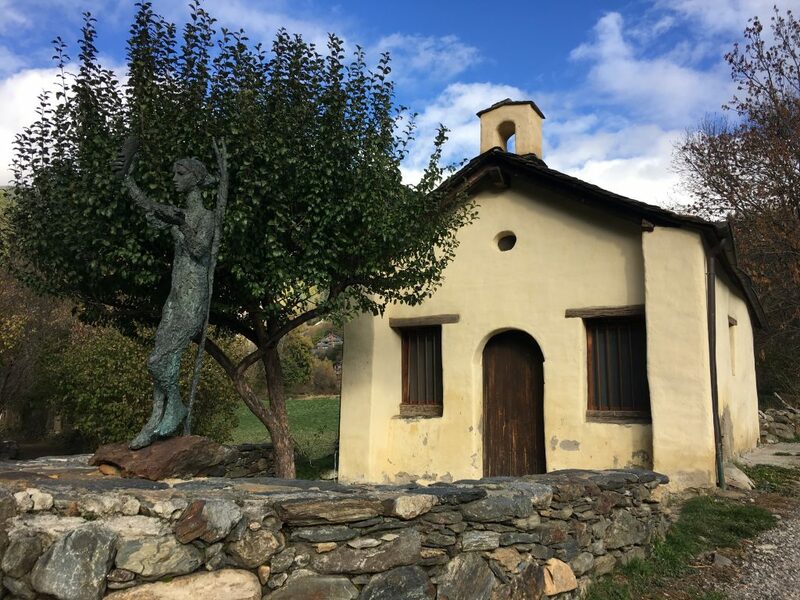 First of all we needed to get to the start of the trail, which meant either a drive or a walk to l’Aldosa de la Massana, a small hamlet just about 2k to our southwest. We decided to walk and picked up the Cami deles Molleres, wiggling back and forth up steps until we reached the CS-335 road. We had to walk south along this road for a few minutes before we found the start of the path on our left marked with a wooden sign. It took us up what looked like someone’s drive before leaving asphalt and carrying on around the north of the property’s garden. 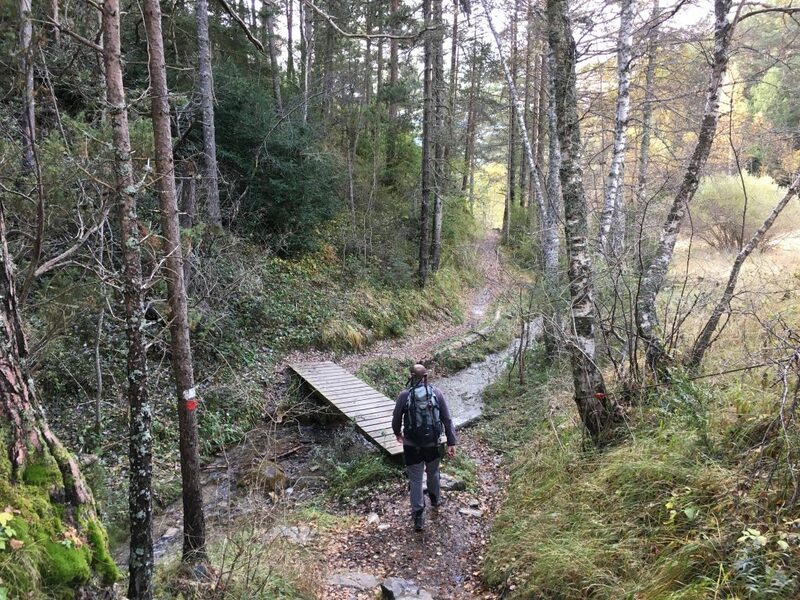 Now we were on a proper trail, pleasantly rocky underfoot, that took us through the woods slowly gaining height and with nice views to the south across the valley. As we approached the highest point (about 1920m) we met a track, which we followed up a switchback into snow. Not enough for snowshoes (we hadn’t lugged them all this way), just a crisp coating on the grass. We followed the sign that took us over the small clearing and into the woods beyond. 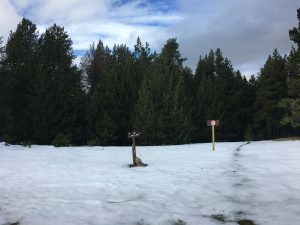 Now on the north facing side of the hill the snow was more widespread, we crossed the closed and uncleared Coll d’Ordino road a couple of times as we worked our way down the path slipping over slush on rocks and tree roots and being dripped on by branches of slowly melting snow. 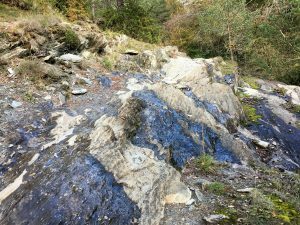 As we worked our way lower in the valley we started following the narrow stream of the Riu de les Aubes as it gurgled down towards the village of Ordino. 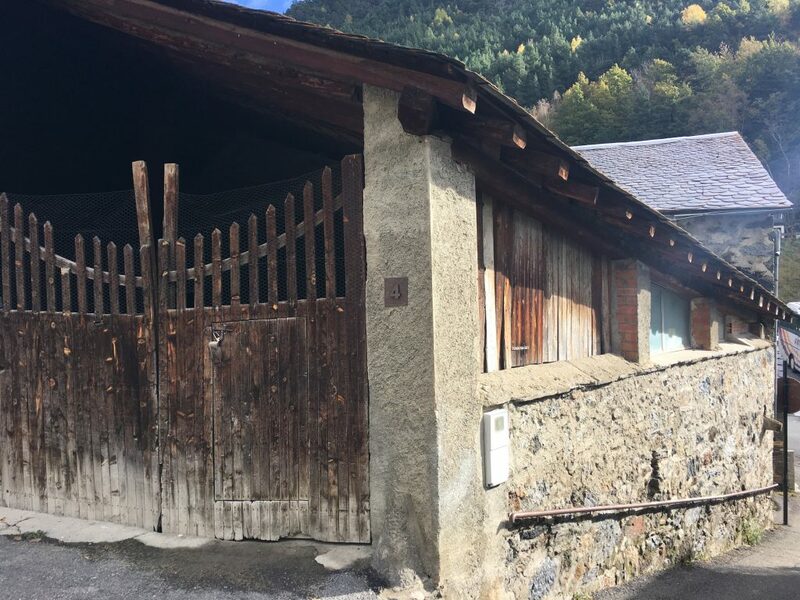 Once the village had been navigated we were on the track of the Cami de Santa Barbara back into La Massana where we had to endure a walk along the road back to the parking spot. Walking along the road was the only downside to a pleasant wander in the hills around La Massana. As we had overstayed 24 hours we decdied we might as well remain in our parking spot for a second night. A few minutes of google map searching later revealed there was a self service laundry in town (I’m still not happy to hand my dirty knickers over to just anyone) so that was our plan for the following morning. I carried a fat holdall of washing down to the Net and Sec ‘bugaderia’ and wandered around the town while it washed and then dried. Paul spent the time giving Bertie’s innards a good clean and taping over some of the holes in our heating vents (like the one that warms up the food cupboard – completely unnecessary). After lunch we were on our way back out of Andorra into Spain, the traffic was a lot more normal than it had been on our arrival and the only hold up was a cursory inspection of Bertie as we went through customs. We concluded that, despite our first impressions, we quite liked the bustling energy of the principality and would be happy to come back and explore it a little more. 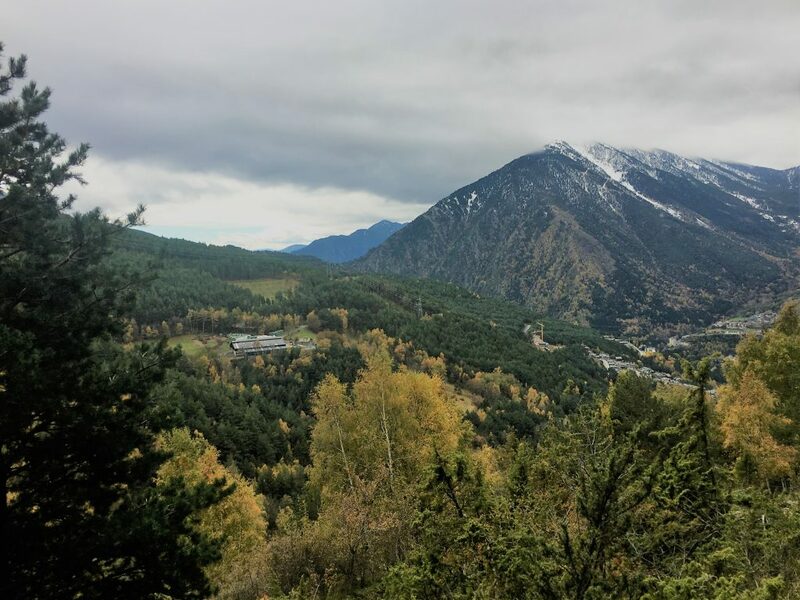 There’s more to Andorra than duty free.